Small - $40.99 X-Large - $40.99 Only 2 left! A good soldier needs to be prepared for anything at the drop of a hat, which is a tough job even in the best situations. We freak out when our break room runs out of coffee and we don't even have to sneak through an enemy-controlled bunker to get more! We can't imagine checking our email only to be told to drop down and crawl because the enemy is lurking in the next cubicle. 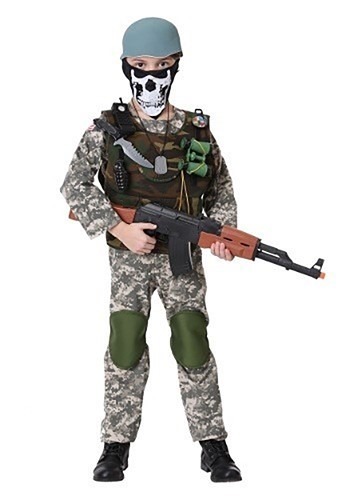 Your little soldier will always be prepared with this Camo Trooper Costume! It comes with everything they will need to stay on top of any situation, including a digital camo jumpsuit and woodland camo vest to quickly blend into different environments. The green foam helmet will help them blend in and green foam knee pads help them stay comfortable while doing all that crouching and kneeling during recon missions. When he puts on the scary black skull-printed bandana, it will show the bad guys he means business! It also comes with plenty of cool equipment (it's just plastic though because the real equipment is heavy!) like toy binoculars and a walkie-talkie and other gear so your trooper will have any situation on lockdown when the bad guys show up! Luckily, your little soldier seems to be tougher than us, so they can complete their mission and watch their buddy's back even without that second cup of joe in the morning. It sure helps a well-trained soldier to have plenty of gear to let them do their jobs effectively. We're talking digital camouflage to help stay hidden when sneaking around, protective vests and helmets, radios to send and receive updates and call for backup, and all kinds of other hi-tech hardware to stay one step ahead of the bad guys. Looks like your kiddo is ready to get on the move!